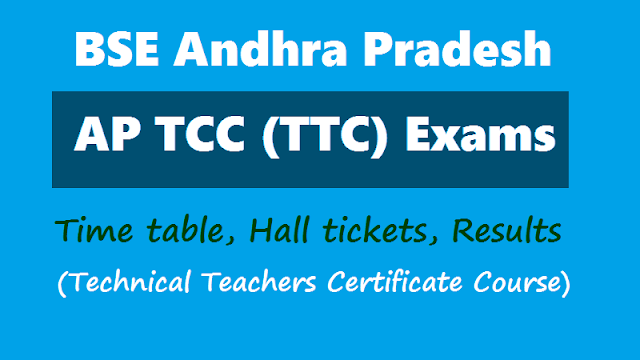 AP TCC /TTC Exams Time table, Hall tickets, Results (Technical Teachers Certificate Course) 2019 details at DGE AP (BSE AP) Web Portal : bse.ap.gov.in . AP TCC Exams Time table, Hall tickets, Results / AP TTC Intimation Cards: AP TTC Exams 2019 Time table, Hall tickets Results (Technical Teacher's Certificate Course), TTC Results, TTC Marks Memos download, Technical Teachers Certificate, TCC Results, TCC Marks Memo, Technical Certificate Course Results, TTC AP Results 2019, TTC Telangana Intimation Cards: DGE AP, BSE AP, Technical Teacher's Certificate (Lower Grade) Exams 2019 Time Table, AP TTC Exams 2019 Time Table, 42 Days TTC Summer Training Course 2019 Exams Schedule. టీచర్స్‌ సర్టిఫికెట్‌ కోర్సు లోయర్, హయ్యర్‌ గ్రేడ్ల పరీక్షలు జ‌న‌వ‌రి 28వ‌ తేదీ నుంచి 30వ తేదీ వరకు నిర్వహించనున్నట్లు డీఈవో ఓ ప్రకటనలో తెలిపారు. దీనికి సంబంధించిన టైంటేబుల్‌ను విడుదల చేశారు. పరీక్షలు రాసే అభ్యర్థులు http://main.bseap.org/ వెబ్‌సైట్‌లో రోల్‌నెంబరు, పరీక్ష కేంద్రం వివరాలను ప‌రీక్షకు వారం రోజుల ముందు డౌన్‌లోడ్‌ చేసుకోవాలన్నారు. హాల్‌టికెట్‌ల‌ను నేరుగా పరీక్ష కేంద్రంలోని చీఫ్‌ సూపరింటెండెంట్‌ నుంచి పరీక్ష జరుగు రెండు రోజుల ముందు తీసుకోవాలని చెప్పారు. ఇతర వివరాల కోసం డీఈవో కార్యాలయంలో సంప్రదించవచ్చని తెలిపారు. DGE AP, has notified that, the Technical Certificate Course (TCC) in Drawing Handloom Weaving and Tailoring and Embroidery in both Lower & Higher Grades Examinations, January 2019 will be conducted from 28.01.2019 to 31.01.2019 at the notified Examination Centres in the State. The Hall Tickets denoting the Centre Name, Time table and Roll No. of the candidates have been hosted on this office Web Site www.bseap.org to download their Hall Tickets by the Candidates and to appear for the Examinations. Further, it is also notified that the Handloom Weaving (Lower & Higher Grade) candidates of Srikakulam, V izianagaram. Visakhapatnam, East Godavari , West Godavari & Krishna Districts have been allotted to the Examination Centre at AVNM High School. Srikakulam and the rest of Districts i.e., Guntur, Prakasam, Nellore, Chittoor, Kurnool, Kadapa and Anantapuramu have been allotted to the examination centre at SBVD Sabha High School, Pullampet, Kadapa District. 1. Candidates shall bring their downloaded web halltickets to the examination center daily with out fail. Otherwise he/she will not be allowed to the examination. 3. To avoid discomfort the candidates shall locate their examination center in advance. 4. The candidates who opted in two trades shall appear only one trade, otherwise his / her performance in the both trades will be cancelled. The candidates pertaining to 81 , 82 trades (tailoring and embroidery) shall bring their sewing machine, scissors, measuring tape etc.. And the candidates pertaining to 41 , 42 trades (drawing) shall bring their pencils, colour pencils scale eraser etc.. To the exam centre. BSE AP notified that the Technical Certificate Course Examinations will be conducted from 28.01.2019 to 31.01.2019 as per the Time Table given below at the identified examination centers. The Hall tickets to the Candiates about the Roll No. and Examination Centre can be download one week befre the commencement of the examination from the official website adn visit the examination center one day before to avoid last hour confusion. - AP TCC Tailoring and Embroidery, Handloom Weaving,Drawing Exams Time Table 2019.